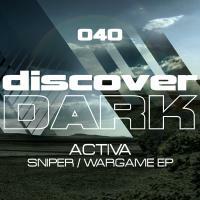 With his first single of the year, Activa steps up to the mark with a release on Discover's suitably named Discover Dark offshoot. Hot off the press, 'Sniper' is as much about techno as it is about trance with its twisted grooves, filtered riffs and all round filth. Rob's collaboration with Peetu S, which first featured on his excellent debut album "This World" keeps the riffs simple and bassline driving to push this E.P. home into heads down groove based darkness!! Reaky continues this theme with his rework as Discover Dark hit's the ground running for 2010. 'Sniper / Wargame EP' is available now from Beatport and iTunes.